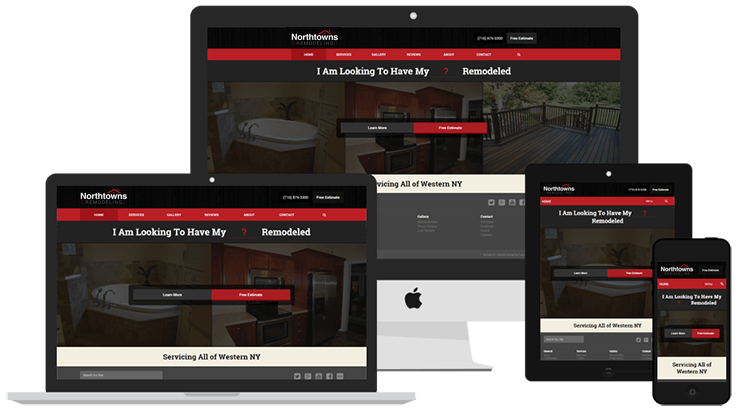 Northtowns Remodeling Corp. - Portfolio | CyberBytes Inc.
Northtowns Remodeling Corp. has always been seen as a general contractor from the consumer standpoint. Everywhere they advertised, there would be a large focus on six main services: bathroom, kitchen, accessibility, window, deck, and siding. The work they did ranged from additions and siding, all the way up to highly custom bathroom and accessibility renovations. The largest part of their business consists of bathroom, kitchen, and accessibility services, yet their branding did not at all reflect that. We worked very closely with the owner, Brian. The first step was to put all of this down in writing and discuss his vision and goals for the company. We explored what type of work they should really be specializing in, and what type of work they should avoid doing. It's difficult to be a custom and specialized company when your branding shows that you offer everything under the sun. The problem with having so many service offerings is that you cannot focus down your brand to mirror more of a specialized and custom service offering. We knew we had to narrow down these 6+ services down into two or three parent services. After further discussion and exploration, we came up with three main service categories to focus the company on: bathroom, kitchen, and exterior. Bathroom would have a sub-set of accessibly, as would exterior. The exterior service would consist of window, deck, and addition. 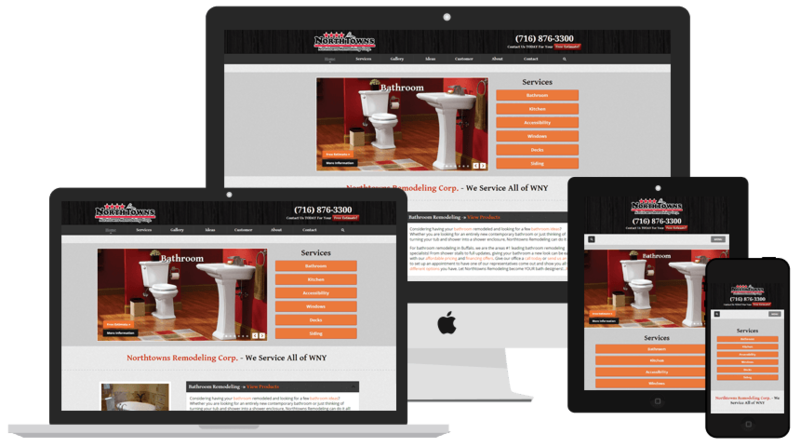 This allowed for the potential customer to immediately know the strengths of Northtowns Remodeling while still offering the same services as before. Properly organizing the company's brand strategy was just the first step in evolving the overall brand, next came the logo design process. Northtowns Remodeling Corp. has been around for over a decade and the previous logo was made without any brand strategy in-mind. The logo did not work well on dark backgrounds, was too complex, and was not consistent across print and online media. We needed to develop a logo and wordmark that we could use on t-shirts, hats, and print media as well online media like social networks. It was important to create a logo wordmark, as well as a standalone logo that could over-time be recognized. We had to develop something that would give off a premium service feeling that also works closely with the new brand strategy of the company. We sat down with Brian to discuss the company in more detail. This worked well because we had already worked with him on developing their brand strategy. We discussed various aspects of the business including the the target audience, main competitors, color preferences, and any ideas that were already in-mind for the redesign. After the initial exploration meeting, we then moved onto phase 1 of the design process. This consisted of 9 low-res concepts that we then ran usability tests on and presented to Brian for him to choose what direction we should move towards for phase 2. After choosing concepts #2 and #9, we then made further variations of each before presenting them and moving to Phase 3. The final phase consists of a few minor tweaks and refinements and a complete vectorized versions of the logo and wordmark.